Killer Characters: All Hallow's Eve and Kindle Giveaway! 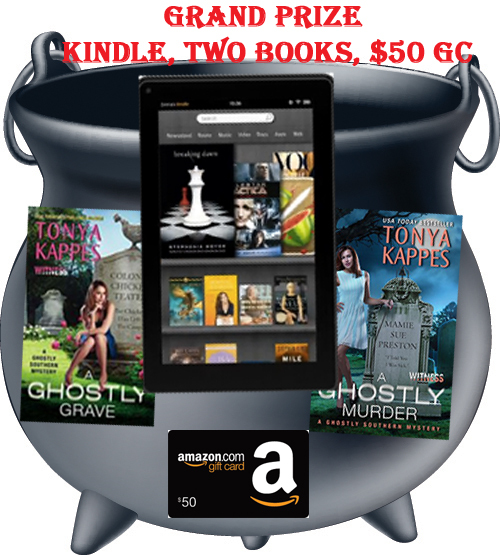 All Hallow's Eve and Kindle Giveaway! Ahh. . .it's the most special time of year. It's time for Whispering Falls annual All Hallow's Eve celebration and you know what that means. There will be visitors galore in our little magical village and everyone is in a flurry trying to get our shop windows decorated, candy for the little goblins, and shops stocked full of goodies for the tourists to buy. I'm especially excited about the new shops that have opened up in Whispering Falls. Crazy Crafty Chick shop has all that yarn in the window display. The sign on the door is a sign up for craft night. I'm definitely planning a girls night there. Now that sounds like a lot of fun. Up on the hill, next to Two Sisters and A Funeral, is an art gallery, Blue Moon. Oh! Look over there. Next to The Gathering Grove Tea Shoppe. Scented Swans Candle Co., I can't wait to go in there and pick out some special holiday candles. My shop will be smelling so good. But I'm most excited about the Happy Herb shop next to my store. I love the idea that I can go over there whenever I want and pick out special herbs for special potions. Look over there at my ornery Fairy-God cat, Mr. Prince Charming. What does he have in his mouth? Is that another charm? Another charm for my bracelet? Another charm that is supposed to give me protection? Oh no. . .I knew something evil was lurking. . .
Do you like Halloween? Leave a comment to win an audio book in the Magical Cures Mystery Series! Be sure to scroll down to enter for the Kindle. Happy reading! ~xo June Heal, homeopathic spiritualist and owner of A Charming Cure. AN AUDIO BOOK FROM THE MAGICAL CURES MYSTERY SERIES! TO ENTER, leave a comment on this blog post with your e-mail address. If we are friends on Facebook, I can get in touch that way, and feel free to friend me if we aren't! Friend me on Facebook here. * Follow me on Twitter here. Learn about my books here. Order your copy of A Charming Voodoo today! Bubble. . . bubble. . .
Whispering Falls is abuzz with the new housing development and new shops popping up all over the magical village right before the annual All Hallow’s Eve celebration. Cures and trouble. . .
June Heal’s intuition is on high alert and she just can’t shake that something bad is about to happen. Magic stirs . . . June finds Violet Draper standing over a dead body In the new pumpkin patch hours before it’s supposed to open for hayrides. And trouble doubles . . .
Once again, June has to put her sleuthing skills to work and figure out who the real killer is before the new citizens pack up and move right back out of town. I love Halloween all the candy Lol!!! Never read your books. They sound really good. I used to love Halloween when I was younger. Now, I fall into the catagory of I don't care one way or the other. The company I work for used to let us dress up and decorate and we went all out for Halloween. Then later in the afternoon you could bring your kids in to trick or treat. One year we were in an old bank building that still had the vault in the basement and the created a really cool haunted house down there. They don't allow us to do that any longer. Those were the good old days! Hahha! I still love it! I still dress up even though my four boys are all men now. What a nice giveaway. I love Halloween and all the decorations. Halloween is the most magical time of the year! Halloween is not what is used to be. I used to get tons of kids. Now I just get a few. I love audio books. I agree! We used to get a lot of kids too, but the ones we do get are so darn cute! I change my decorations from fall to Halloween to fall again! I love it. I like Halloween but Christmas is my favorite. Halloween marks off the time of change in weather and air. In Florida when we get to the 70s, we're excited! OH!! Yeah...I love Christmas too! You bet, lots of chocolate with none of the work of the other major holidays. Oh my. I can't buy the candy until the day or I would be eating it. I love it too! Thank you! You are so kind. I can't wait to read Tonya's latest. She is such a hoot! Awe! Thank you so much! It is so much fun. I love looking at all the kiddos. I think I want to live in Whispering Falls. I love Halloween - not the zombies but the old fashioned, classic movie and cute kiddos in costumes kind. Thanks for the giveaway. I want to too! I love the old fashioned Halloween too. I can't wait until the Charlie Brown special next Wednesday. On my TBR. Have a Happy All Hallows eve. Now that my kids but one are out of the house, I don't put up as much either. When one of them came home from college, he was a little disappointed. I love how they look into their bag to see what I gave them. So cute. Love all the chocolate, and it is always fun to see the costumes the kids are dressed up in. I love Halloween! Your witch hat is so cute! Thanks for the giveaways! Thank you! I love it too. So fun. I love Halloween! It's such a fun holiday! Seeing all of the kids dressed up is great. :) I've never read any of your books, but I certainly plan to soon! The little ones are so adorable. I love them too. Thank you so much for stopping by. All Hallows Eve. Spooky good time. Love seeing the kids dressed up for Halloween,it's nice to see them having fun. Thanks for the great giveaway, would love to have one of your books on audio. I love all of it ! YAY! I was so lucky to get her. She's so awesome. Thank you! Halloween is a lot of fun. I love Halloween, I love seeing how creative people get with decorations and costumes. I have this HUGE pumpkin head that clicks on my carriage light outside of my house. I adore it. Oooh, that would be cool! Ooh, a new series to read. Don't know how I've missed this one. Sounds fun especially during the Halloween season. kchinetti at gmail dot com. Hahha! Yes! I love writing it Thank you for stopping by. I love Halloween! I love decorating, carving pumpkins, making spooky desserts, and yes I still dress up! Oh yea! We love to carve the pumpkins. It's still so fun even though our kids are grown men. It's such a cozy time of year. I love it! Halloween has always been my favorite holiday! Tonya Kappes books are some of my very favorites - it's like a little bit of Halloween in every book 🎃 My favorite part is watching classic spooky movies and making caramel apples to enjoy. Great blog! I love Halloween and the fall decorations. It becomes a little crazy at school though. The kids think Halloween lasts all of October. A student once commented on October 31st that it was the last day of Halloween! Halloween is a magical time of year and so fun...thanks for the giveaway please enter me. Congratulations Marilyn!! You won the audio book and I've mailed it to you! I love Halloween. We always go all out because it's my son's birthday. We decorate inside and out and have a big costume party. We even has a haunted room one year. I am a big Tonya Kappes fan, and am starting to get hooked on audiobooks...I love it. Halloween is a favorite time of the year. I love changing into sweaters, anything pumpkin spiced, and the smell of Jack o' Lanterns glowing on the porches. I enjoy Halloween for all the decorating and since it's a non-serious holiday--just fun. But most of all I like Halloween because it's a good excuse to eat candy corn. I love Halloween...the changing weather, the house decor, the candy sales, and the smell of Jack o' Laterns glowing on the porches. I also love audiobooks!